Black Pepper Essential Oil - Amphora Aromatics Ltd – Supplier of pure essential oils and aromatherapy Products. The most common use of Black Pepper oil in aromatherapy is probably in massage blends for muscular pain, stiff and achy joints and fatigue. It commonly features in massage blends for dancers and those taking part in sporting or strenuous activities. It's a strong oil in both action and odour so should always be well diluted (we recommend a maximum of 1-2% in a blend with other oils - see Blends Well With below). It may also benefit people suffering with rheumatism and arthritis. 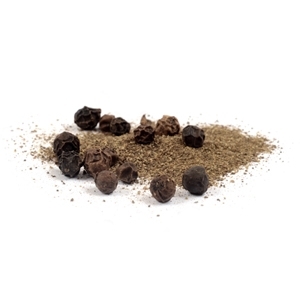 Aromatherapists use Black Pepper to treat digestive tract problems due to its antispasmodic, carminative and tonic properties. It's used to improve sluggish digestive systems. It can also be used to treat anaemia as it stimulates the spleen and so assists in the creation of new blood cells. Most essential oils generally blend well with one another. You may find that Black Pepper blends especially well with bergamot, clary sage, clove, coriander, fennel, frankincense, geranium, ginger, grapefruit, lavender, juniper, lemon, lime, mandarin, sage, sandalwood and ylang-ylang.